And yes, moms can be *seriously* fit. 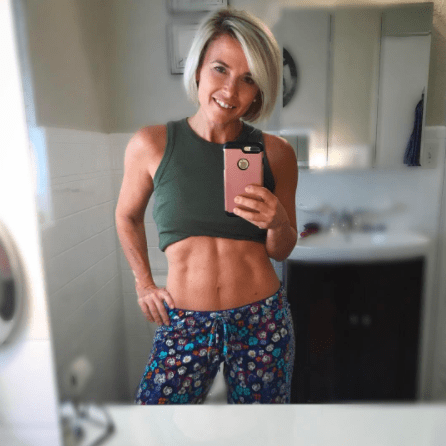 If you happen to be a mom constantly seeking motivation from other mamas who are feeling and looking good after kids, your search for inspiration can pretty much start and end with @moms.can.be.fit. Even if you don’t quite fall into this category, you should still probably join the 96 thousand people who are already hooked on Tiffanie’s no-excuses — yet totally accessible — approach to wellness. We recently got Tiffanie hooked on our online classes, which have added a fresh challenge to her routine while simultaneously addressing some of her unique health needs. 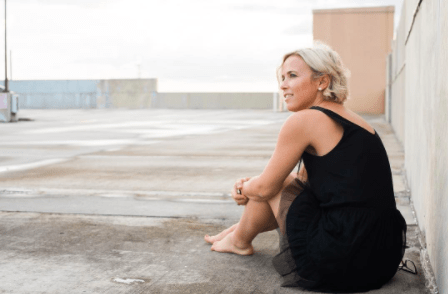 Keep scrolling for more thoughts on kickstarting a fitness plan, overcoming challenges, and learning to love yoga from this integrative health coach and Instagram rock star. Q: Give us the nuts and bolts of your journey with personal fitness. What inspired you to get started? A: In 2015, I was 41 years old and so out of shape and tired all the time that I found myself missing out on social activities and on time with my kids. I was embarrassed with how I’d let myself slide. I was on a beach vacation when I decided that enough was enough. I started getting healthy from there! 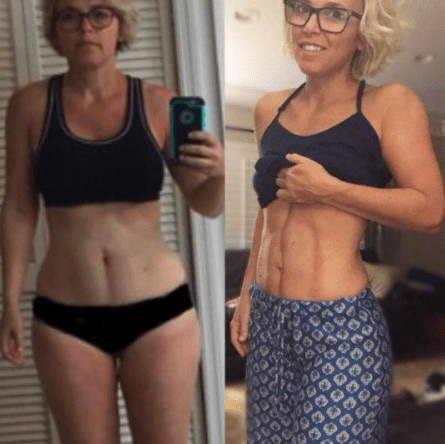 A year later, we returned to the same beach, but I was in a completely new body — one with energy and a new lease on life, one that I could be proud of. Q: What challenges have you faced in your fitness journey? A: Unfortunately, life is messy and complicated, and it’s not always easy. In December 2016, I found myself depressed and fatigued. I was experiencing unexplained weight gain and an overall feeling of sadness. I found out that I had an autoimmune disease of the thyroid called Hashimoto’s. Thankfully, I was able to radically change my diet and make lifestyle changes that allowed me to thrive again. My Hashimoto’s was in a remission of sorts, basically asymptomatic. Four months later, while skiing in Montana, I tore my ACL and was forced to have reconstructive surgery. By keeping my nutrition in check, I was able to maintain my progress and actually continue to lean down, even while I was not working out! Q: Before you learned about bulldog, what was your experience with yoga? A: I was never very interested in yoga. I always wanted my workouts to be intense, because that’s what I understood was necessary in order for them to be effective. Sitting on the floor moving my body in certain positions couldn’t possibly help shape my muscles or get me the body I desired… or so I thought! Q: What do you love about bulldog? A: Because of my autoimmune disease, I’ve had to learn to treat my body in a way that doesn’t put it through unnecessary stress. For me, it’s actually counterproductive to work too hard! Activities like spinning or long-distance running are too hard on my body. Before bulldog, I was also looking for a form of exercise that would help me recover my flexibility after my ACL reconstruction. I love the fact that all of the bulldog classes challenge me in a way that I didn’t expect. My muscles shake and I know I’m getting a great workout in, without the undue stress that my body really can’t handle. My favorite thing is being able to access a class anytime, anywhere. I’ve been known to attend a class when I’m down at the beach or in my living room at home! 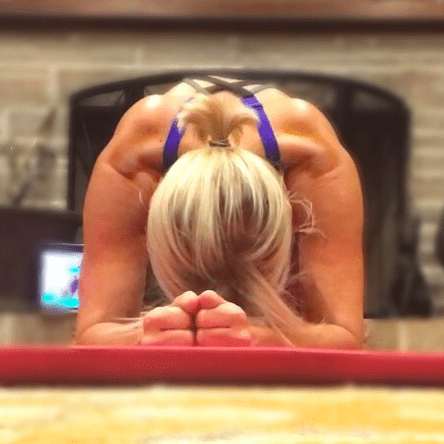 Q: How has bulldog yoga helped you reach your fitness goals? A: bulldog came to me in a time when fitness was uncertain. I was just returning to the workout scene and really needed to find something that wasn’t just kind to my recovering leg, but that would also challenge me in other areas. Since starting with bulldog yoga, I’ve increased my flexibility and the strength in my legs, which is paramount for my full recovery. Q: What would you say to people who are skeptical of yoga as part of their fitness routine? A: I think that the key to lifelong success in a fitness lifestyle is finding a variety of practical things you enjoy doing. I love that I have access to bulldog right on my phone and can take a class whenever the mood strikes. It’s fun, challenging, and definitely a great tool for any fitness arsenal. Q: What makes you feel #bulldogstrong? A: Loving yoga, without being a yogi! Being #bulldogstrong means being inclusive of all types of people, with no pretense or sense of “only the cool kids” being allowed. Q: What words of wisdom would you give other people tackling their own health and wellness? A: Honor your body each day. Throw out the desire to be perfect. Instead of striving for perfection, choose to honor yourself daily. That’s going to look different each day, but it all adds up to something pretty amazing. How has yoga helped you overcome unexpected challenges in your own fitness journey? Tell us on Facebook + Twitter!